Western blot analysis of extracts from various cell lines using GCN2 (E9H6C) Rabbit mAb (upper) or β-Actin (D6A8) Rabbit mAb #8457 (lower). Immunoprecipitation of GCN2 from HT-1376 cell extracts. Lane 1 is 10% input, lane 2 is Rabbit (DA1E) mAb IgG XP® Isotype Control #3900, and lane 3 is GCN2 (E9H6C) Rabbit mAb. 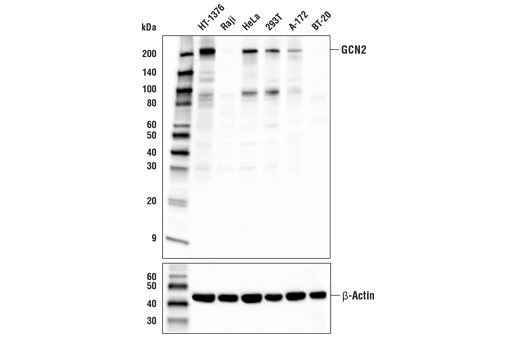 Western blot analysis was performed using GCN2 (E9H6C) Rabbit mAb. 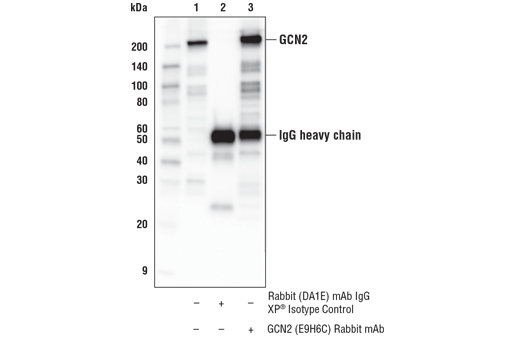 GCN2 (E9H6C) Rabbit mAb recognizes endogenous levels of total GCN2 protein. Monoclonal antibody is produced by immunizing animals with a synthetic peptide corresponding to residues surrounding Pro217 of human GCN2 protein. Phosphorylation of the alpha subunit of eukaryotic initiation factor 2 is a well documented mechanism of downregulating protein synthesis under a variety of stress conditions. Kinases activated by viral infection (PKR), endoplasmic reticulum stress (PERK/PEK), amino acid deprivation (GCN2) and hemin deficiency (HRI) can phosphorylate the alpha subunit of eIF2 (1,2). GCN2 is also required for UV-light induced translation inhibition, and in vivo phosphorylation of murine GCN2 at Thr898 is induced by both UV irradiation and by leucine deprivation (3). UV-induced activation of NF-kappaB also requires GCN2, which may act simply by preventing translation of IkappaB-alpha to replace pools that have been ubiquitinated and degraded (4). Interestingly, proteasome inhibitors (MG132 and ALLN) activate the GCN2/eIF2alpha pathway, suggesting a pivotal role for this kinase in stress response and ubiquitin-mediated signaling (5). In vitro autophosphorylation of yeast GCN2 within its activation loop at Thr882 and Thr887 (Thr898 and Thr903 in mouse) has also been reported (6). Deng, J. et al. (2002) Curr Biol 12, 1279-86. Jiang, H.Y. and Wek, R.C. (2005) Biochem J 385, 371-80. Jiang, H.Y. and Wek, R.C. (2005) J Biol Chem 280, 14189-202. Garcia-Barrio, M. et al. (2002) J Biol Chem 277, 30675-83.